California Sunset Sage is a striking combination of dark orange and peach. The buds are a vibrant orange but when the flowers open they reveal a softer orange lined with the narrowest dark orange edge. 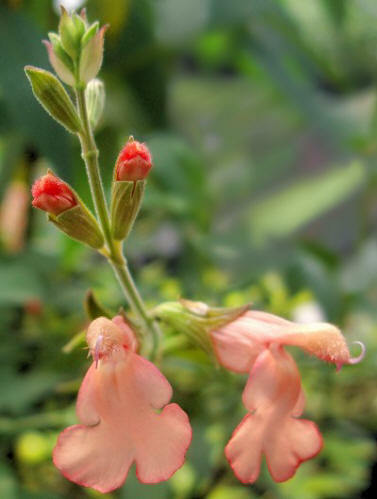 Like all Salvia greggii it blooms in early spring, stops when the summer gets too hot and then continues on in fall. California Sunset Sage makes a great addition to our Edible Flower Herb Garden Six Pack. This plant is sometimes available in plug trays. These trays hold 128 of all the same plant. They are a great low cost way to fill a lot of space. Each cell is 3/4 of inch by an inch. Check here to see if California Sunset Sage Plug Trays are available.